Bigger isn’t always better. But sometimes it is. And that’s the case with the SMOK TFV8 tank. 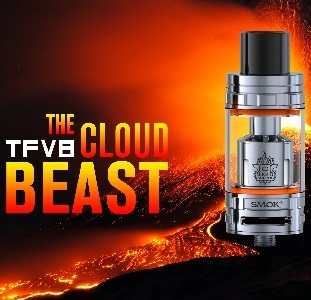 SMOK builds on the extremely popular and highly rated TFV4 for what they call “The Cloud Beast,” the TFV8. DirectVapor supplied the new tank for Seven Report to review. SMOK kept most of what worked from the TFV4 and enlarged it on the TFV8. The capacity of the top filler is 6.0 ml with the smallest of the included coils installed, the T8-Q4. With the larger T8-V8 or the V8 Turbo RBA the capacity is 5.5 ml. The TFV8 has two adjustable airflow ports, compared to the four on the TFV4, but those two ports represent an 18% increase in airflow. The air tube on the TFV8 has a 15% increase in diameter and 30% in area for a truly beastly amount of vapor output. And the drip tip on the TFV8 is also larger. I did really like the two layer drip tip with additional adjustable airflow on the TFV4 and wish SMOK had replicated it on the TFV8. 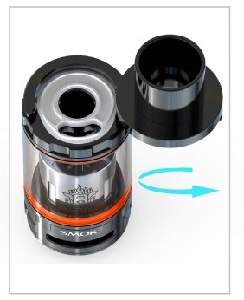 With the new dimensions of the new tank, SMOK has also developed new coils. The TFV8 ships with two coils and that V8 Turbo RBA. The V8-T8 is a 0.15 ohm octuple coil with a wattage range of 50 – 260 watts, though SMOK says it preforms best between 120 – 180 watts. 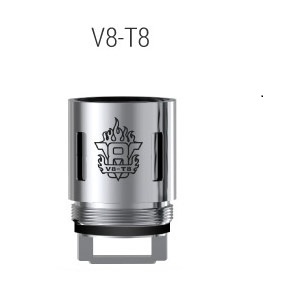 The TFV8 comes with the V8-T8 installed. Also included in the package is the V8-Q4 0.15 ohm quad coil. This coil has a wattage range of 50 – 180 watts with a “best” range of 90 – 150 watts. And then there’s the V8 RBA 18 mm deck that comes with 0.28 ohm Clapton dual coils installed. Suggested wattage range for the V8 RBA is 50 – 140 watts. SMOK kept the top rotary refill design with the TFV8, which is the most convenient system for filling I’ve ever used. Simply press down slightly on the top cap and spin it counter clockwise to open it. Insert your dripper into the ejuice slot and fill the tank. Then spin the top cap closed. The ejuice slot on the TFV8 is also larger than the one on the TFV4, but still small enough to make it easy to slop a little ejuice while filling. Performance: When I reviewed the SMOK TFV4 it got great marks for performance. The TFV8 is even better. It produces an unbelievable amount of vapor and flavor, bringing out the full flavor of each ejuice I’ve vaped in it, with all of each flavor’s nuances. That’s due to two factors. First is the increased size of the airflow ports, air tube and drip tip. And the main reason for all of that tasty vapor is the SMOK coils. With those amazingly wide wattage ranges you’ll really be able to fine tune and personalize your vape and find the sweet spot for each ejuice you use. Features: The TFV8 is an extremely feature rich tank. That top rotary refill design makes filling the tank really easy and, if you’re careful, neat. Adjustable airflow, the inclusion of two coils and an RBA deck, spare glass tank, cotton for the RBA and spare parts are all solid pluses. The real stars of the SMOK TFV8 are those coils and their wide wattage ranges. SMOK also offers the 0.2 ohm V8-T6 sextuple replacement coil with a wattage range of 50 – 240 watts with a “best” range of 110 – 150 watts. With those three coils and the V8 RBA available, the TFV8 has features that should satisfy vapers of every experience level. The TFV8 is available in silver or black. Quality: SMOK has designed another high quality piece of equipment with the TFV8. It’s solid and well built. The top rotary fill system is a tad on the stiff side, and I found that it closes easier if you press down lightly as you spin it shut. The coils for the TFV8 are excellent and last for an almost unbelievable length of time. I’ve been vaping with the original V8-T8 octuple coil for about a month with no sign of wear. They provide loads of vapor and full flavor. If there are any negatives to the TFV8 it’s that, like it’s smaller brother the TFV4, this tank is a bit of an ejuice hog. And all of that cotton retains the flavor of an ejuice even after you’ve filled the tank with another flavor. I have noticed a little ejuice seepage, but I think that’s from ejuice slopping onto the seal around the ejuice fill slot. It doesn’t happen often and I can’t find any evidence of ejuice coming from any other part of the tank. Looks: This is a good looking, impressive piece of equipment. The SMOK logo etched into the base of the tank really pops. The orange o-rings give the TFV8 a very distinctive look. And those big coils, with the logo and wattage ranges etched into them really look good through the glass tube. Price/Value: SMOK lists the TFV8 for $59.99. Not a bad price for a tank that performs so well and has so many features. DirectVapor, who supplied the SMOK TFV8 tank for Seven Report to review, has it available for $38.95. That’s a steal. Replacement coils for the TFV8 may run a little more than those for some other tanks, but these things last longer than any other coil I’ve ever used, so chances are you’ll need to replace them much less frequently. I was really happy with the SMOK TFV4, and it would still be my go-to tank if not for the TFV8. This is truly a Cloud Beast. 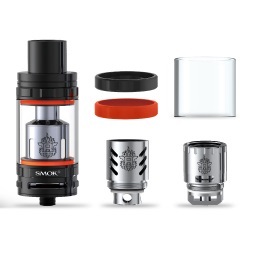 While SMOK has not yet released Nickel or Titanium coils for this tank, many late model mods will work in temperature control mode with the existing coils. But even if your mod doesn’t have that capability, I don’t think you’re going to miss TC that much once you’ve experienced all that full flavored vapor the SMOK TFV8 produces. There are quite a few very good tanks on the market today. The SMOK TFV8 will give all them a run for the money. This is a can’t miss piece of equipment that should satisfy any vaper for a long time. I’ve been vaping with the SMOK TFV8 for about a month, using it on the Kangertech KBOX 200 and KBOX 160 with a wide variety of ejuices. DirectVapor, a Seven Report advertiser, supplied the SMOK TFV8 Tank for the purpose of this review. 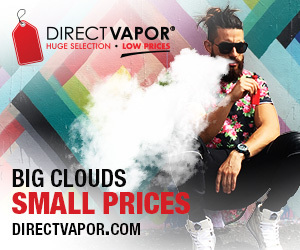 Order the SMOK TFV8 from DirectVapor.